$35 up to three toppings. Dine in only, not for delivery. Welcome to Geno's Pizza, located in Eau Claire, Wisconsin. We soon hope to be known as a favorite eating-place for locals and tourists alike. 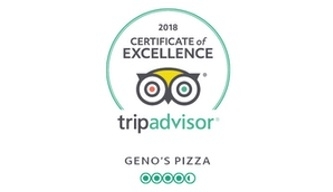 At Geno's Pizza, every selection on the menu is made from the freshest ingredients. Premium quality meats, cheeses, savory spices and zesty toppings are all served with attention to detail, for your full dining enjoyment. Locally owned and operated with dine-in seating available.